The armed school officer branded a coward by President Donald Trump has defended his actions during the Marjory Stoneman Douglas High School shooting. 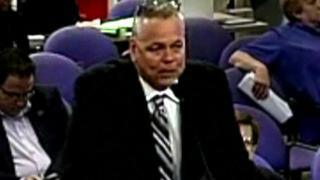 Scot Peterson was outside the school when a gunman killed 17 people, but did not go inside as shots rang out. Mr DiRuzzo said it was "patently untrue" that Mr Peterson was a coward on the day. Mr Peterson, a veteran officer who had been assigned to guard the high school, resigned last week after his boss, Broward County Sheriff Scott Israel, suspended him without pay. Sheriff Israel said that footage from the scene had left him "devastated" and "sick to my stomach". But Mr DiRuzzo accused the sheriff of "at best, gross oversimplification", saying he "jumped to a conclusion" about Mr Peterson's behaviour. Mr Peterson said he had originally "received a call of firecrackers". Only when he ran towards the sound, he said, did he realise it was gunshots. Broward Sheriff's Office had trained him to seek cover and assess the situation in the event of outdoor gunfire, his lawyer said. Mr Peterson did so, and then told the sheriff's office he had heard shots, prompting a "Code Red" lockdown of the school campus. When police arrived, he told them he thought the gunman was outside - a belief backed up by "radio transmissions [which] indicated that there was a gunshot victim in the area of the football field," Mr Peterson said, according to his lawyer. His attorney said in a statement: "Let there be no mistake, Mr Peterson wishes that he could have prevented the untimely passing of the 17 victims on that day, and his heart goes out to the families of the victims in their time of need. "However, the allegations that Mr Peterson was a coward and that his performance, under the circumstances, failed to meet the standards of police officers are patently untrue." Meanwhile, Georgia Republicans are threatening Delta Air Lines after it joined a host of companies that have ended discounts for National Rifle Association (NRA) members in the wake of the Florida school shooting. The US state's Lieutenant Governor Casey Cagle vowed to block legislation containing a lucrative jet fuel tax exemption that would benefit the carrier. 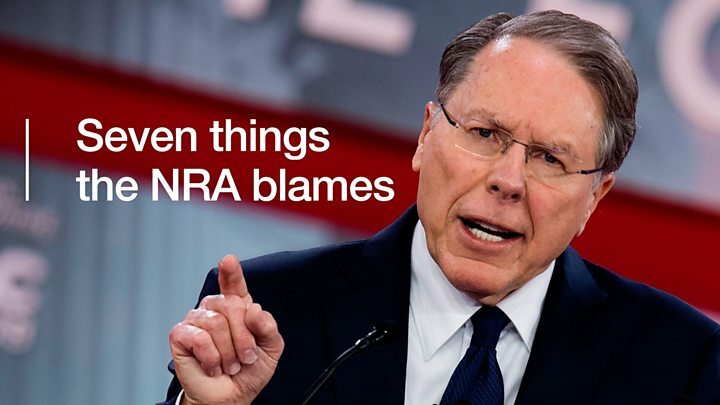 "I will kill any tax legislation that benefits @Delta unless the company changes its position and fully reinstates its relationship with @NRA," Mr Cagle wrote on Twitter. On Saturday, Delta and United Airlines stopped offering special rates to the more than five million NRA members. Car rental firms, banks, insurance firms and hoteliers have also withdrawn deals for the gun lobby group since the 14 February attack at Marjory Stoneman Douglas High School. On Monday, the president asserted that he would have run into the Florida high school if he had been there, even if he had not been armed. "I really believe I'd run in there even if I didn't have a weapon," Mr Trump told a group of state governors at the White House on Monday. Mr Trump also said it was "frankly, disgusting" that officers apparently did not confront the suspect on 14 February. Broward County Sheriff's Office is reportedly also investigating why three of its deputies appeared to remain outside the building with their guns drawn as the attack unfolded. Mr Trump criticised those officers as well, saying they "weren't exactly medal of honour winners"- a reference to the US military award for valour. In Florida, students are preparing to return full-time to their classrooms on Wednesday after some attended a volunteer "orientation" on Sunday. "It's like the first day of school," a 16-year-old girl in attendance told the New York Times. The massacre was the second-deadliest ever shooting at a US school. Nikolas Cruz, 19, a former student at the school, has been charged with 17 counts of premeditated murder. Police have said he admitted the shooting. In the aftermath of the attack, students from the school have founded a movement campaigning for gun control, which has seen them march on their state capitol. 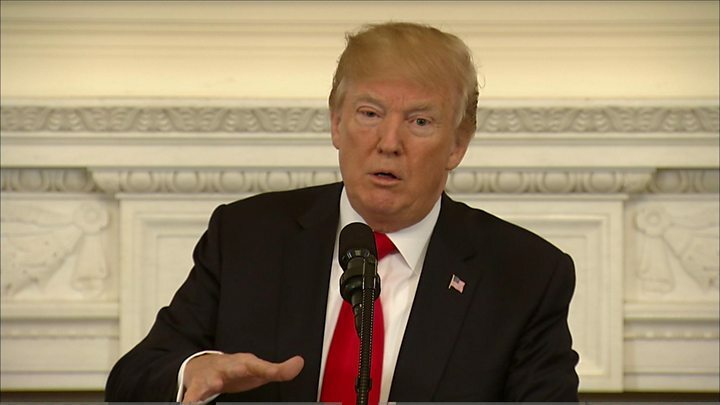 President Donald Trump has pledged action on mental health and background checks, hosted a listening session with some students and teachers, and called for teachers to be armed with concealed firearms.